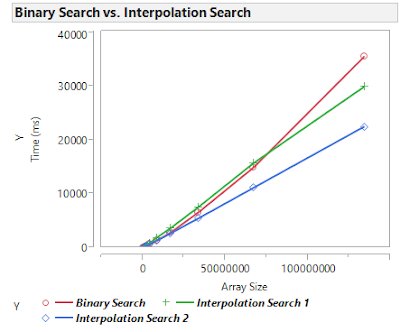 In my last blog post, I introduced interpolation search, a searching algorithm that can beat binary search asymptotically. To introduce the concept of interpolation search, I made a simplifying assumption that the underlying data came from a uniform distribution. 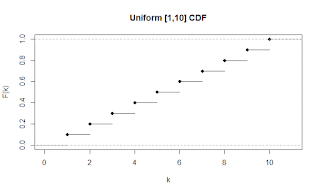 It is still possible to use interpolation search on non-uniform distributions, as long as you have the CDF for that distribution. A cumulative distribution function is a function that tells you the probability that a random item from the distribution is less than or equal to a specified value. If you have taken an introductory computer science course, you've probably seen the binary search algorithm - an algorithm to efficiently find the index of an item in a sorted array, if it exists. You might not have heard of interpolation search, however. Interpolation search is an alternative to binary search that utilizes information about the underlying distribution of data to be searched. By using this additional information, interpolation search can be as fast as $O(log(log(n)))$, where $n$ is the size of the array. 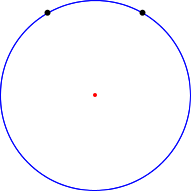 In this post I am going to talk about two implementations of interpolation search. First, I will discuss the algorithm as described on Wikepedia, then I will describe my own version of the algorithm that has a better worst case time complexity than the first and performs better in practice than the traditional binary search and interpolation search algorithms. Generating random numbers is an important aspect of programming, and just about every programming language offers some source of (pseudo) randomness, usually in the form of a uniform distribution. For example, java has a builtin function, <code class="java">Math.random()</code> that returns a random floating point number in the range $[0,1)$. In some instances, we would like to have random numbers coming from a different distribution, but most programming languages don't offer this functionality (except very specialized languages such as R). 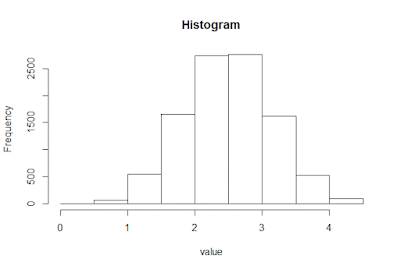 In the rest of this blog post, I am going to explain how you can use a uniformly distributed random number to generate a number from some other distribution. You may have found this site by searching for information regarding Project Euler Problem 184. This is not a solution to that problem. In fact, it really bothers me when I find people who post their solutions to these problems online, especially the higher level ones. In this blog post, I talk about a simple problem from probability that was motivated from this Project Euler problem, but the solution to this problem is not likely to help you solve that one.